Rule 23: Storage is IN something never ON something. Storage must be finite and defined. The space in a Hackerspace is real estate. That space is precious. That space is sacred. That space is finite. It can be measured. Its so sacred that the word SPACE is one of the most common words for almost all hackerspaces, even maker spaces. Its easy to remember that space is an important part of these ventures. Its right there in the name. And space is very important. I don’t just mean a room or a building either. A space is very expensive because you have to buy or rent it from someone. We often forget the value of clear space. Importantly space, literally empty space is as imuch of if not more of an asset to any hackerspace as are any number of fancy tools. Yet so often we fill those spaces with various form of junk. I think junk can be defined in many ways. It is usually waste, items-of-potential, projects and other ill defined cruft. Going forward I will call it all cruft. Sometimes in a space it very hard to tell whats part of the space and whats part of the cruft. I will go into how cruft occurs and what it is and its many forms in another post. So, cruft. Copious amounts of cruft. Perhaps the best philosophy is to ban anyone bringing anything at all into the space. But that seems a little impractical, and some members want to be able to store projects they are actively working on and be able to store sheet materials, other stock such as filament and a plethora of other nicknacks for craft, electronics and whatever. What happened was members filled up their boxes with cruft they never touch, then started putting stuff in special places. One member put stuff inside a MAME cabinet another in an underused cupboard. Later some special?! members got 2 boxes, both more or less untouched and full of cruft. My own box? Full of cruft. There is now also Large Project Storage or LPS. LPS at the Nottingham Hackspace includes a label printer linked to Hackspace Management System. A video was made showing how the system works. But the system lacks policing. Without someone spending hours and hours a month keeping on top of checking the projects, asking owners if its done with, trying to work out which of the myriad parts of the project belong together and what is simply left overs from someone else’s removed project. Chasing people up. Adding notices of disposal NODs etc etc. Its a very labour intensive system and you don’t have to encounter the wrath of a member who has wrongfully had their project trashed many times before you decide its not a fun hobby. When the shelving is full, people squirrel projects elsewhere (they do this anyway even if the shelves are empty). Its easy to hide a project in the hackspace because its very hard to work out what is part of the hackspace and what is someones project. There is just so much cruft in the whole space you can’t see the cruft for all the official looking cruft thats already in there. Invariably when talking about this issue someone will say “Oh thats easy at Cheltenham* Hackspace we solved this and we do x…” Well that’s peachy. But frankly I’ve heard a lot of these solutions. Some of them are good and some of them are bad and some of them are entirely reliant on a person, somehow. I am very much a student of W.Edwards Demming** in this. There are (often) no bad workers, only bad processes. For me, any process that is reliant on some super trustee or person who nominates themselves to manage this is a bad process. Or at least, is just a person standing in for a process. A person who if they stop doing what they do or get burned out, everything will pile non the less. I’d like to go into “official cruft” in another post, as well as space organisation and designation as well as tools and materials and the other objects needed for a good hackspace. Being able to workout what is and is not the stuff of the hackspace is highly important but its not project storage and this post is about that. All storage should be a finite space. Storage should be measurable as a unit of storage, lets image a shoebox shape is one unit of storage. There should be lots of shoe box sized units. There should also be 10 shoebox tall sized units and 100 shoebox square units. Ultimately you should be able to say this project is 2 units. There should be lots and lots of it in all areas where people like to or need to store things. Not just in the one area but wherever its needed. 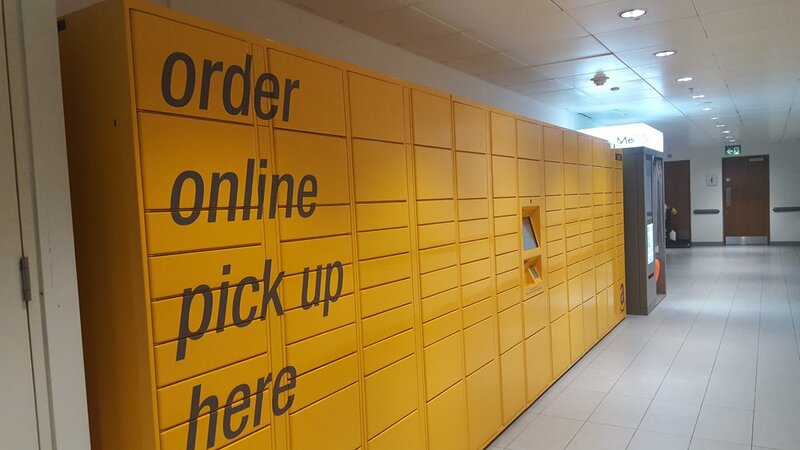 So why the picture of the Amazon locker? For me the system should be something like that. Not as expensive or robust as the amazon locker, it could be built out of wood. Or be units with doors on a shelf or a draws or lockers or even boxes with lids. But it shouldn’t be a shelf or a floor or a worktop or a room where there’s always just a little empty space to stack or squirrel something else. Ideally the system is managed by something like the door access system (at Nottingham Hackspace we have the wonderful HMS Hackspace Members or Management System that already manages access to the space, LPS, the laser cutter and many other things and is linked to a money account). When you need storage you RFID onto the system and it allocates you some units of storage and a door pops open. You can store your stuff with in the rules of the space, for as long as you need to. The system will know if you’ve been accessing the storage or not and see if you’ve been hogging it. Other members will also see this data, possibly anonymised. If there are fewer spaces than are needed (I’d encourage more to be built) the member can ping the system and go on a waiting list. All members currently using (and possibly hogging) a storage locker can paged and encouraged to free up the locker if its under used. Lockers could also be booked ahead of a project, encouraging members to plan more. Lots of lockers can also be made available for when a member wants to be spontaneous. This need not be expensive, though it would be something of an investment, and would likely pay a return in usable and much tidier and therefore safer workspace. In reality the self policing aspect would really work in that members would think more actively about managing their storage knowing there is data collected about project storage and that they can see that others need the resource too, data that is currently masked or hidden or not even considered. In conclusion, this rule of thumb in its simplest term is this. Storage is IN something never ON something. Please note this is basically a work in progress and you MIGHT see this post again, refined and edited. Feed back is VERY VERY WELCOME. * It always seems to be Cheltenham. *** This is what is meant by storage should be IN something. Now if the item to be stored is say a car, then a marked out space for 1 car is fine… what would not be fine it piling another car on the top or squeezing every available inch of space around and under the car with laser off cuts… not so much. That unit could be 1 unit for car ONLY and so on. **** It might be that abuse or use over the rules of the system is penalised with a monetary charge or similar. That would be a local matter for decision on a case by case basis.